Aerohive’s Cloud Networking provides customers with rapid feature and bug fix availability, operating in a continuous delivery mode and ensuring that HiveManager is automatically updated with the latest capabilities. Last year alone more than 50 core features were added to HiveManager. Our engineering team continues to produce innovations to help organizations take on both the challenges and opportunities presented by the ubiquitous demand for mobility-first network access. While continuous Cloud updates ensure Aerohive customers receive the best management experience on their network, administrators still remain in control of device updates, ensuring minimal downtime and disruption. Hardware OS updates can be scheduled for all or part of the network devices, at a time convenient for the organization. Aerohive customers and partners can find the latest product enhancements and feature previews within the administrator communications tab of HiveManager. 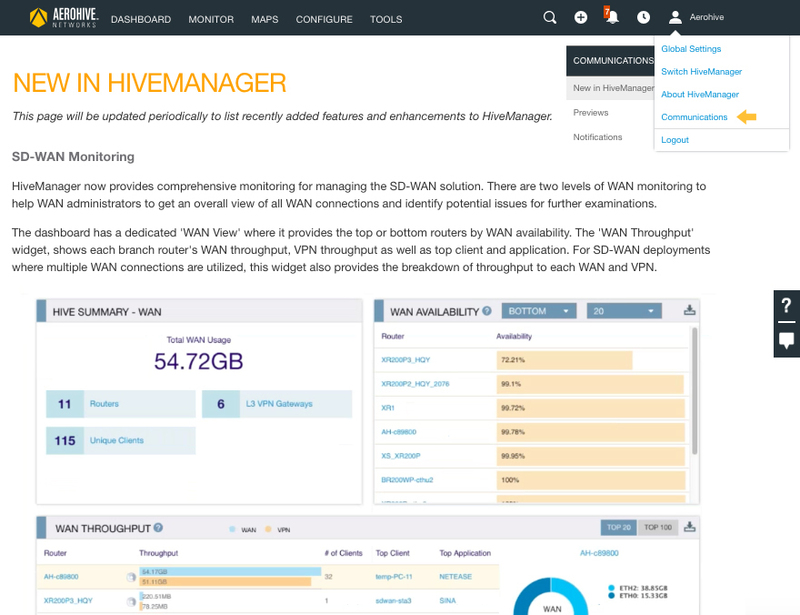 The “New in HiveManager” page describes the latest scheduled Cloud updates, including an overview of exciting recently released features, and an advanced sneak preview into some of the innovations in the pipeline.